It is now common knowledge that I love drinking tea and that my favourite tea brand is Bluebird Tea Co, who conveniently have shops near to me in Tunbridge Wells and Brighton. They stock just about every conceivable flavour of black and green tea you could imagine and also bring out limited edition seasonal blends. It was their pumpkin spice chai that first brought them to my attention- fingers crossed it will be back in the shops in the Autumn! Bluebird very kindly sent me their new limited edition flavoured matcha collection to try ahead of their launch today, as well as a scoop for using the perfect amount of matcha (about half a teaspoon for one cup). 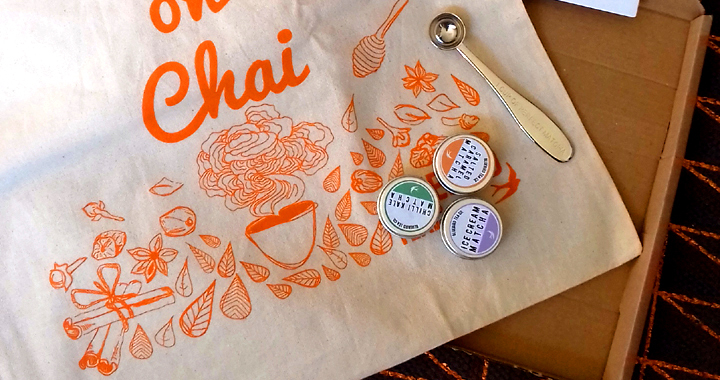 I also got a canvas bag from them with the slogan ‘high on chai’- and if you’ve had the pleasure of trying their sticky chai tea, you’ll understand these words! I have never had flavoured matcha before so I was really intrigued to see what these three limited edition matchas tasted like: salted caramel, ice cream and chilli kale. All three are naturally flavoured, so there is nothing synthetic added to them. Initially it was the ice cream I was drawn to as I thought the vanilla flavour of ice cream would match the matcha well. My favourite way to drink matcha is as a matcha latte, with nicely frothed milk (sometimes with normal milk and sometimes with either oat milk or coconut depending on my mood) and so for each flavour I made up a latte to try them. Ice cream and matcha- sounds like a winning combination! 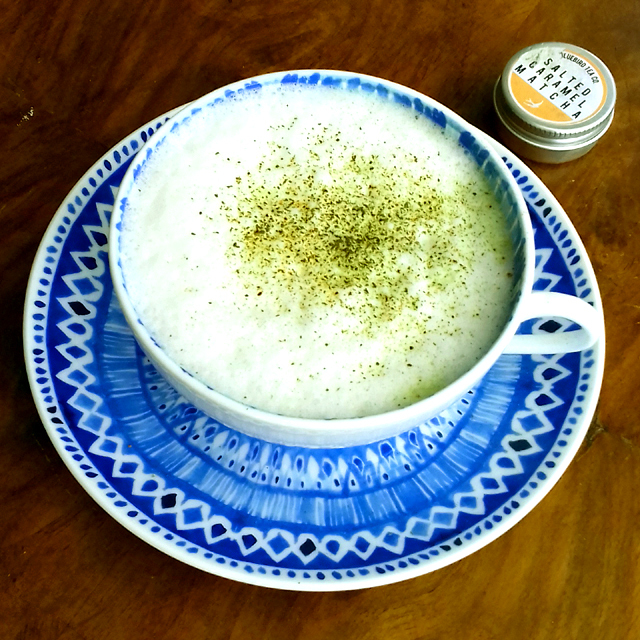 With carob powder and vanilla flavouring, it makes a creamy, smooth matcha latte. I mixed just a little agave syrup in this because I wanted to sweeting it without affecting the flavourings in the matcha. I think this one will also be amazing as an iced matcha, with a scoop of vanilla ice cream mixed in. 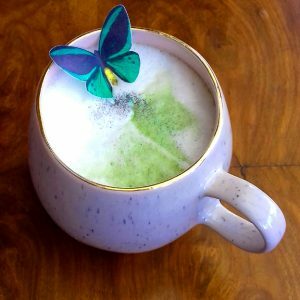 I topped my matcha latte with a wafer butterfly and green edible glitter, because nothing beats a pretty drink! This matcha is mixed with cocoa powder and does have a caramel flavour, but I would have preferred a stronger saltiness. I love salted caramels and chocolates and I didn’t get that sharpness from the salt that I would have like. Try topping with spray cream and a drizzle of caramel sauce for a more intense drink. 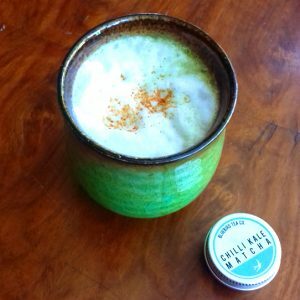 This was the last of the three that I tried as I wasn’t at all sure about combining matcha, kale and chilli. It sounds an odd combination, but I do like a bit of heat to my food so why not my drinks too? I made this up and sprinkled cayenne pepper on the top for an extra kick. It is actually surprisingly nice. Not as pleasant to my palate as the other two flavours and there is a different green, grassy flavour coming through from the kale. The chilli is very pleasantly warming; the kind of heat that warms you through to your ears. I think this matcha will be perfect in the Autumn when the nights draw in and the mornings have a chill, as a warming morning pick me up. I didn’t add any sweetness to it and didn’t feel it needed it, but if you wanted it sweeter I would try adding a dash of vanilla syrup to take the edge off the kale. By far my favourite out of the three blends is the ice cream matcha and I think this would be amazing not only in drinks but in recipes for matcha biscuits, cakes and pancakes as well. I do feel that the salted caramel and ice cream are similar and follow a similar sweet ‘dessert’ theme whereas the chilli kale seems a bit like the black sheep of the family. Nothing wrong with a black sheep of course, it just doesn’t feel like it fits with the collection. Bluebird’s limited edition matcha collection is out today, available in 30g and 100g tins and will be available until the end of October. Posted in Reviews, Uncategorised and tagged Bluebird Tea Co, Green Tea, Matcha, Review, Tea.